I'm going fishing with my son Richard for a week so no updates during the second week in April. When we get back there may be a few fish to show (I hope!). For anyone unfamiliar with the site always check the FISHING ARCHIVE and TACK-TICS pages. The former now extends back as a record of four years of (mostly) sea fishing and may be a useful guide as to when to fish (I'll put the freshwater stuff on once this is up to date). I keep adding to it and to the tactics pages which are mostly 'how I do it' plus a bit of science. The Fishing Archive is effectively my diary and the saltwater pages are up to date. Ben, one of my grandsons, came to stay for a day this week. He brought his new (Christmas) rod and reel and was dead keen to go fishing. The river coarse fishing is closed now, the sea has been fairly quiet as it often is this time of year and the weather was a bit cold for carp fishing (at any rate the carp don't bite fast enought to keep Ben interested). 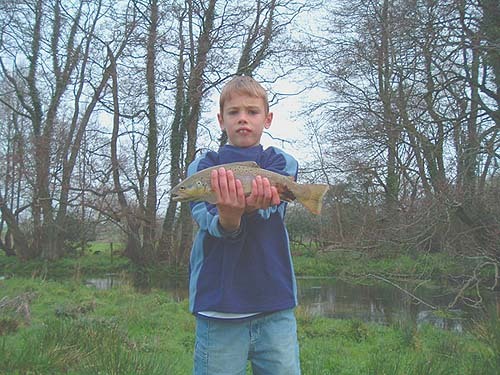 I decided that the best bet for a catch was a small, overgrown stream containing brown trout. Overgrown is a polite word for the stream - it's years since I went there and in places it was like fishing the Matto Grosso. Many of the banks are thickly lined with shrubby alder trees and their branches often meet just above the surface of the water. There are lots of fallen boughs in the stream and where it is open to the sky Ranunculus forms a bank-to-bank carpet. 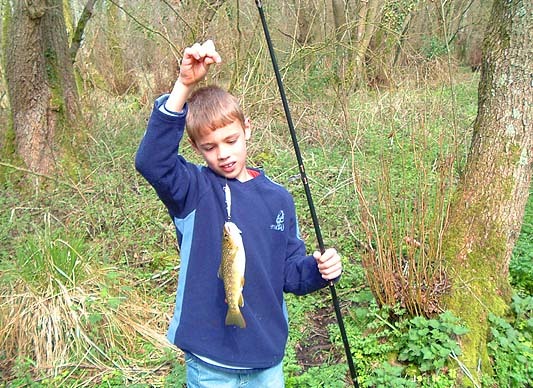 Not the easiest place for a youngster to fish. When we got to the stream I had a quick word with the farmer - a friend of mine - and we walked across the field to the river. Ben had never caught anything on an artificial lure so I decided that it was worth a try. I tied on a floating 7cm plug and showed him how to drop it in the water and let it drift downstream over likely spots. 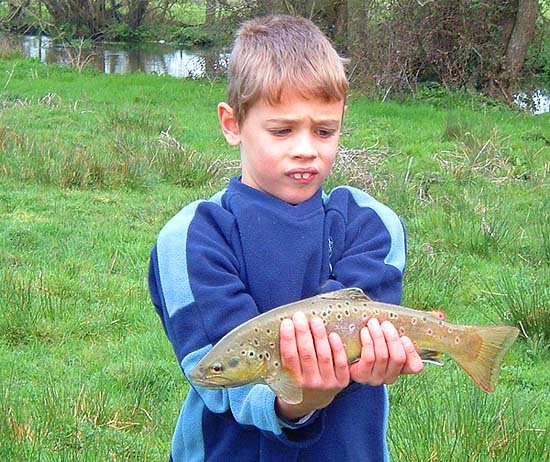 When the plug had gone past a trouty looking spot Ben retrieved it slowly, trying to avoid the numerous snags. For five minutes there was nothing doing apart from one decent fish that bow-waved away as we approached (that's the snag of approaching from upstream). We reached a spot where a big alder on the far bank leaned out over a hole in the weeds. Ben's plug drifted nicely past the hole and with his rod held high, to keep the plug up, he began to wind. Wallop! 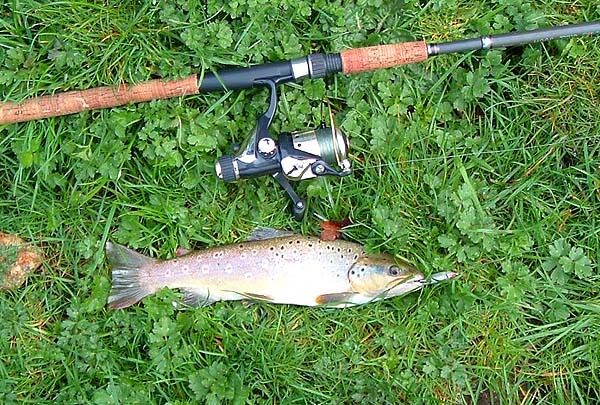 The little spinning rod danced and jerked as a nice trout grabbed the lure and flung itself into the air. The fish wriggled and splashed about but it was only a short time before Ben managed to slide it ashore. He was chuffed. In the course of the next half hour we had three more (smaller) trout and missed a few more (including a couple of good ones). It turned out to be a lovely sunny day and with his first browny (other than a parr) and his first fish on a lure we were both well pleased. I remember that feeling of success.